After my experiments with brewing ginger beer, I’m going to keep the drinks theme going here. In my many hours of browsing food websites (I live in London – I spend a lot of time sitting in buses checking out blogs on my phone! ), I recently came across a recipe for something called oleo saccharum. If you’re wondering what that means, then you share the exact same thought that popped into my head when I heard about it. It roughly means “sugary oil”. Sounds unappealing, but bear with me. The idea is a way to extract an intensely flavoured syrup from citrus peel, and so it is perfect for mixing up drinks and cocktails. You simply take a bunch of citrus peel, trim off any bitter pith, then pop in a bag with some sugar. Seal the bag, rub the sugar into the peel to get things going, and let everything sit until the sugar dissolves and turns into a richly flavoured and very aromatic syrup. Well, that’s the theory. And while most people seem to make oleo saccharum from citrus peel, there is no reason you can’t get a little creative. If it’s aromatic and could go in a drink, you can mix it with sugar and wait. If you’ve ever left strawberries to macerate in a little sugar in a bowl, you get that sweet, pure syrup after a while – well, that’s basically it! The key thing here is that there is no cooking involved, so you don’t risk the volatile aromatic elements of your ingredients being lost. Just mix your ingredients and allow time to do the rest. 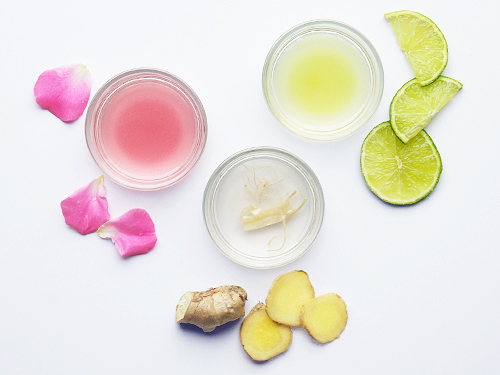 So I had a go at making three types – a lime version as a nod to the traditional, plus ginger and rose. Three very different ingredients, resulting in three aromatic syrups. Of the three, ginger was definitely the easiest and gives the best yield. I had a large, juicy bulb of ginger, so it was pretty evident that this was going to provide a lot of flavour. 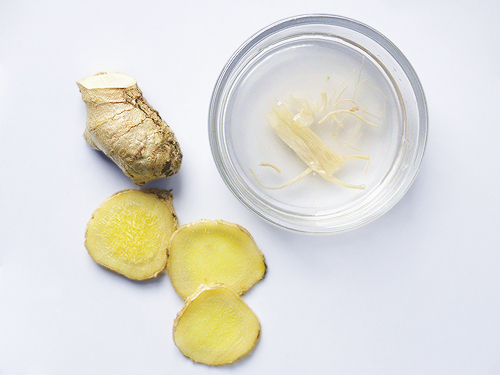 Peel it, slice it and chop it – don’t be tempted to grate it, as you’ll lose some of that all-important ginger juice. As there is a lot of moisture in there, the sugar really does a good job in sucking out all the ginger flavour, so you get a decent amount of syrup. As a bonus, the remaining ginger is sweet and perfect to add to a fruit salad or sprinkle on top of desserts, cakes etc. The version with lime was pretty successful. What you do need to accept is that you will need to add a lot of lime peel to get a decent amount of oleo saccharum, but after that, things happen pretty easily. Of the three versions, I think this is the one that benefits most from being put into the bag with the sugar, and having an extended period of, ahm, “caressing” to allow the rough sugar crystals to work their magic on the zest, extracting those precious aromatic oils. The result was an intensly-perfumed syrup with a strong, fresh lime aroma and a little bitter twist, ever so slightly reminiscent of marmalade. I think this is a good option for a cocktail where you want something more sophisticated than just plan sour and a basic lime flavour – give an extra twist to a caiperinha, or make an old-fashioned with just whisky and orange oleo saccharum. If you’re keen to get a food yield, I would opt for oranges or lemons (easier to peel, and less dry) or go for the more exotic flavour of grapefruit. Last but not least was the version made with rose. This really was a spur of the moment decision, but I am lucky enough to have some beautiful pink and red roses in the garden with a heavy scent. A few were just past their best, so I took the chance and tried it out. Of the three, this was definitely the trickiest. I had imagined that the rose petals would contain sufficient water to make this a doddle, but it seems that there was not actually that much moisture in them. Rubbing the sugar and petals in the bag did seem to break them drown and draw out the colour and flavour, but it seemed very dry, so I had to add a few drops of filtered water to make sure the sugar went from a thick, sticky mass to a syrup. This was really a case of drop-by-drop. Sadly, the result did not look like the pretty colour of the pink roses from my garden, rather it was a dirty reddish-brown hue. Not what I was looking for! Then then I remembered that you need to add lemon juice, and just one drop transformed this oleo saccharum to a soft pink. Perfect! While a little more demanding to make, I think the flavour of the rose oleo saccharum was really quite remarkable. 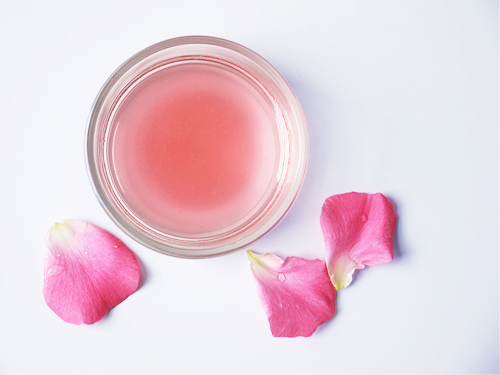 Rose extract or rose water can often be very flat and synthetic, to the point of being overpowering, but made this way, the flavour really does seem to have a light freshness to it. This is not simple and floral, but subtle, complex and with the slightest hint of plant (in a good way). I think could be quite exceptional in a glass of sparkling wine or as the basis for a rose sherbet, where the bubbles will bring those complex rose aromas to the surface to tickle your nose. I hope you’ve found this interesting. I’m keen to try this approach with other ingredients – an easy way to make simply, fresh syrups from soft fruits, but don’t limit yourself. Make the ultimate mint syrup…cucumber syrup…lots of possibilities! The following are a guide only. If you find the mixture is not liquid enough and the sugar has not dissolved, add a little filtered water and leave to rest for another 30 minutes. 1. Mix well. Leave in a covered bowl or bag for 24 hours. Strain. 1. Cut the peel from the limes in strips. Trim off any white pith. 2. Mix well. Leave in a covered bowl or bag for 24 hours. 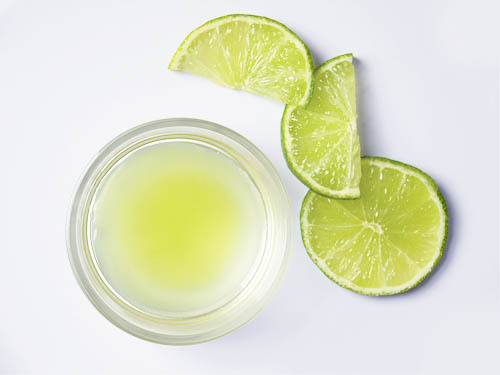 If there is any sugar left, add a little lime juice until dissolved. Strain. 1. Pick the petals from the roses. Check for bugs, rinse gentle and pat dry with a very clean cloth. 2. Place petals and sugar into a plastic bag. Squeeze out the air and rub the sugar into the petals. Leave the rest for 24 hours. 3. Check the oleo saccharum. If not sufficiently syrup-like, add a few drops of water. 4. Add a few drops of lemon juice and swirl until the syrup changes from murky to bright pink. My Mum picked a few handfulls of Chiristmas tree shoots this Easter ( the new, light green, very tender needly branches), popped them in a Kilner jar, covered in sugar and left on the windowsill. All of sugar is now melted and I have been instructed to have a teaspoonfull in hot water whenever I have any breathing difficulties with cold, flu etc! That is an amazing idea! I saw a recipe a while back for picking fir tree green shoots – had no idea you could eat them – but a pine syrup sounds fantastic. I have been wanting to make a version of this for some time. My family recently has gotten really into homemade shrub for mixing cocktails. This recipe looks like the perfect gift for my family. So I wanted to share it with you. I’m a regular avid reader of this blog and think just about everyone should subscribe to it. Enjoy! Hi Emellt – thanks for your comment! One of my friends is also getting into shrub cocktails too, delicious! This is a nice way to add flavours to your mixture. If you’re using as a flavouring in an alcoholic drink, you can also add some vodka, gin or other alcohol to extract maximum flavour from drier ingredients like citrus peel. Happy mixing! I saw your gin post…I see something delicious in my future!